BLUFFDALE, UTAH – February 6, 2018 – Listen Technologies, a leading provider of assistive listening products for more than 18 years, is demonstrating its mobile collaboration device, ListenTALK, at Integrated Systems Europe (ISE) 2018 in Amsterdam this week. ListenTALK recently began shipping globally and has been positively received by AV and systems integrator professionals, as well as end users who use the product. ListenTALK enables clear, secure, reciprocal communications. The product features a pocket-sized device that makes it easy for groups of two or more people to listen and talk with the push of a button. It is ideal for noisy, crowded and/or mobile environments where people need to communicate with others and wish to avoid having to shout or whisper. Applications include guided tours, training and collaboration, mobile sales or safety presentations, intercom/event production, language interpretation, and many more. Listen Technologies already has sold ListenTALK in more than 20 countries. Users have responded very favorably to the product’s range, affordability and ease of use. In Sandy, Utah, Hale Centre Theatre, an entertainment venue with one of the most technologically advanced stages in the world, is using ListenTALK to facilitate behind-the-scenes tours of its theatres and demonstrations of its sound system. Built on the less crowded 1.9 GHz DECT (Digital Enhanced Cordless Telecommunications) band, and offering secure encryption and full duplex spread spectrum technology, ListenTALK delivers the best and most powerful single solution to hearing assistance. ListenTALK groups can be set up quickly and easily using the free software suite, docking station tray, or by simply touching the units together using near field communication (NFC). Unlike other two-way communication systems that require users to manually select channels and configure each individual device, ListenTALK devices can be configured in bulk by the simple push of a button on the docking station tray. Up to 10 groups can operate simultaneously in the same space. Users can also easily switch groups simply by touching the ListenTALK devices to another leader device to pair. The group leader can set up participant talk-back mode as listen-only respond (participants can listen and respond to leader only), or discuss (participants can listen and respond to leader and group) modes. 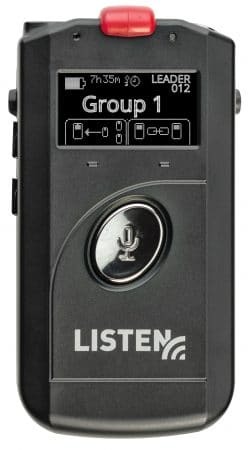 Users have the option to use the ListenTALK transceiver with built-in microphone, or any other standard 3.5mm headset or earbuds (including standard smart phone earbuds). A variety of headsets are available, based on the unique needs of the venue or environment. Users can hear leaders clearly, even in large, crowded or noisy environments, and can communicate with leaders and other participants in a group using the one-touch talk-back feature. Additional ListenTALK features include a removable, rechargeable lithium-ion battery (a battery pack that accommodates AAA alkaline batteries also can be purchased), simple and intuitive user interface, and global technology that enables devices to be deployed worldwide. A convenient, portable docking station case also is available that charges, stores and programs ListenTALK devices.